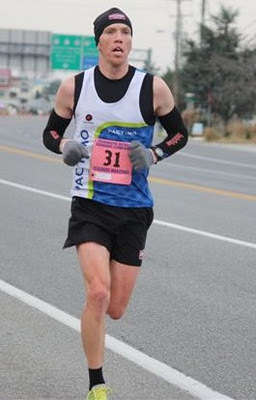 New PCG coach Iain Banks ran his way to 5th place at the Rehoboth Beach marathon this past weekend with a 2hrs 43mins finishing time. Running with the lead group through 10 miles at 59mins, he passed the halfway mark in 1hr 17mins and then hit the headwinds of the Atlantic Ocean. The winds took their toll on the field and split the lead group over the coastal roads heading back to town. Holding strong Iain finished 5th overall and first in the 30-34 age group (by 12minutes). Iain said "the plan was to go out with the front group and hold fast for the first half. The 2nd half was always going to be hard with the winds and it proved to be". The run created an rTSS of 223.....a solid workout for the middle of December! This race was fun, as much as a marathon can be fun and certainly gave me a good run focus heading into the winter. Once again thanks to Ecco for the great Ecco Biom A running shoes, they are my go to racing and training shoe.